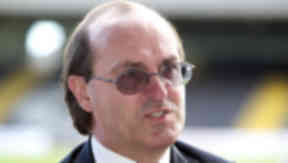 It is alleged Giovanni Di Stefano duped clients into handing over cash by pretending he was a lawyer. A self-styled lawyer dubbed the Devil's Advocate did "nothing" to help a prisoner win his freedom despite charging more than £8000, a court heard. Former director of Dundee Football Club Giovanni Di Stefano, 57, took a payment of 10000 euros from the family of 43-year-old convicted drug smuggler Laurent Penchef. It is claimed Penchef's mother and father are just one of ten sets of victims who lost almost £1m to the Italian. Prosecutors allege his clients were duped into handing over the cash because of his claims to be a qualified lawyer even though he had no legal qualifications. Di Stefano was given his nickname after advising a string of notorious clients including road rage killer Kenneth Noye and timeshare fraudster John 'Goldfinger' Palmer. Penchef, from France, was convicted in 2002 of smuggling cocaine into the UK from Antigua and sentenced to 18 years. He lost an appeal against his conviction in December 2004 but wanted the Criminal Cases Review Commission (CCRC) to re-visit his case in the hope of overturning the verdict and sentence. Southwark Crown Court heard he contacted Di Stefano in 2005 on the previous recommendation of Palmer, then a fellow prisoner at HMP Long Lartin, Worcestershire, and after watching a television documentary. Penchef told jurors he believed Di Stefano was an 'international lawyer working in the UK'. He said: "The first time when I was in touch with Giovanni it was like he knew my case very well. He was fantastic because it was like he knew everything, so I was very pleased, impressed I would say." Penchef said he instructed Di Stefano to pursue his case with the CCRC and the possibility of him being repatriated to France to serve the remainder of his sentence. Penchef's parents paid 10000 euros (£8500) in to a bank account in Italy as instructed by Di Stefano. He then confirmed, in a letter dated July 2005, he would have 'no problems in assisting you with an application to the Criminal Cases Review Commission'. David Aaronberg QC, prosecuting said: "Having received that letter was it your understanding that Mr Di Stefano was going to act for you in those two matters?" The barrister went on to ask: "By January 2006 as far as you were aware had anything been done at all in terms of contacting the CCRC on your behalf?" "No, nothing," said the witness. The court heard that in 2006 Penchef resolved not to return to France as he believed he would spend longer in jail as a result. Di Stefano, of (The Long Barn) North Stream, Marshside, Canterbury, Kent, denies nine counts of obtaining a money transfer by deception, one of attempting to obtain a money transfer by deception, one of obtaining property by deception, three of acquiring criminal property, one of using criminal property, eight counts of fraud and two counts of using a false instrument.